AWD, MOONROOF, REAR BACKUP CAMÉRA W/ REAR CROSS TRAFFIC ALERT, BLIND SPOT MONITOR, PRE-COLLISION SYSTEM, LANE DEPARTURE ALERT W/ STEERING ASSIST, F SPORT LEATHER INTERIOR, F SPORT / ELECTRIC / HEATED AND VENTILATED FRONT SEATS, AUTOMATIC DUAL ZONE CLIMATE CONTROL, LEXUS PREMIUM AUDIO W/ 7’’ DISPLAY / AM / FM / CD / MP3 / WMA / USB / AUX / BLUETOOTH / SIRI EYES FREE / INTEGRATED SATELLITE RADIO W/10 SPEAKERS, LEATHER WRAPPED / 3 SPOKE F SPORT / HEATED STEERING WHEEL W/ PADDLE SHIFTER / AUDIO CONTROL / BLUETOOTH AND DYNAMIC RADAR CRUISE CONTROL, AUTOMATIC HIGH BEAM, KEYLESS ENTRANCE W/ TRUNK RELEASE, PUSH START BUTTON, RAIN SENSING WIPERS AND MORE!! PRICES HAVE ALREADY BEEN NEGOTIATED FOR YOU. 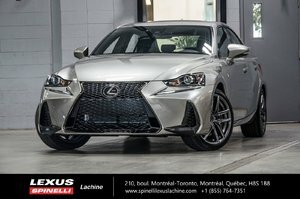 PRICES ARE INCLUSIVE OF ALL LEXUS CANADA DISCOUNT ON TOP OF OUR GENERAL MANAGER DISCOUNT. NEGOTIATED PRICES ARE AVAILABLE ON LEASE, FINANCE OR CASH PAYMENT. FOR MORE INFORMATION PLEASE CONTACT OUR PRODUCT SPECIALIST AT (514) 634-7177. Cylinders : 3.5L Engine at 260 hp / Torque 236 lb-ft - V6 cyl.